Last night I went to see Tim Burton's Alice in Wonderland for the second time, this time in 3D! If you get a chance to go see it, it really is a fantastic film. This time, as I watched, I couldn't help but think of apocalyptic literature (yes, I'm a nerd, but hear me out). Now, ever since I first learned about apocalyptic literature as a genre, studying Revelation and Daniel among others, I have found myself on the look-out for modern examples of the genre. There really is no direct equivalent in modern literature (or cinematography, for that matter) to ancient and/or biblical apocalyptic since we have not adopted the same concepts as that of our ancient counterparts, nor have we incorporated identical understandings of the concepts which we do share. The modern understanding, for example, of a term like "divine judgment" has changed quite a bit from the ancient understanding thereof. Our closest modern correlatives to ancient apocalyptic literature lack the use of surveys through history, ex eventu prophesy so often used by the ancients, and the first-person perspective where we get phrases like; "I heard behind me a loud voice like a trumpet..." (Rev. 1:10), and even if elements like this did manifest themselves in modern fantasy stories or cinema, we'd hardly recognize them as apocalyptic. We just aren't taught to interpret apocalyptic literature. Perhaps this is why we have come up with such strange interpretations of Revelation, Daniel, and parts of Ezekiel. But I think that if we look hard enough, modern films and stories can indeed clue us in and offer us some aid in understanding apocalyptic literature. If we can get some grasp on what elements and purposes are common within ancient apocalypses (perhaps the best introduction is Mitchell G. Reddish's introduction to his Apocalyptic Literature reader) then we may be able to find them in modern art and give some contemporary flesh to our concepts. "a genre of revelatory literature with a narrative framework, in which a revelation is mediated by an otherworldly being to a human recipient, disclosing a transcendent reality which is both temporal, insofar as it envisages eschatological salvation, and spatial insofar as it involves another, supernatural world." Apocalyptic literature is "crisis literature" (Reddish, page24) written for the purpose of encouraging those in crisis to "resist the charms and delusions of the present world" (Reddish, page 26) and to order their lives in light of a greater vision and identity. Apocalypse is a dance between some supernatural realm or vision--perhaps boasted as the most real reality--and the realm of "this-worldly" human experience in which they interact with one another so that the reader, having been made privy to this revelatory vision, must examine their life and identity to either take a new direction or continue in their current direction with renewed vigor and courage. Apocalypse offers a lens, even an eschatological one, through which to interpret experience and to name and identify things for what they really are. And as perhaps one of the better modern correlatives to this genre, I give you Alice in Wonderland. 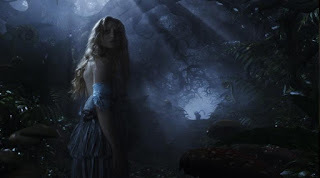 Alice, in her moment of crisis where she is asked to conform to a rigid and decided path for her life and her very identity hangs in the balance, takes "a moment" and finds herself in another world called Underland--familiar, yet so unlike the world in which she resides. To her it's a dream and she merely goes through the motions saying "nothing can hurt me" and "it's my dream." It's never quite clear whether her experience in this strange world is real or imaginary. She continues through her experience with the freedom, since it is her dream after all, to choose her own path and to stand up for what is right (although she does at times let herself be restricted by what she knows of her "real" life)--a freedom which she wanted but from which she was restricted in her this-worldly experience. Her identity and experiences in Underland mingle with her known identity and fears from London until she finally puts the two together and discovers the true essence of who she is, believing "six impossible things before breakfast." This experience, this dream, gives her the strength to choose her own path and to face her crisis with a renewed sense of direction. This vision, "disclosing a transcendent reality which is both temporal... and spatial," helps her to resist the "delusions of the present world," and offers her a new lens though which to interpret reality and her own identity. Having seen a greater vision, she cannot ever go about life the same again. In the same way, apocalyptic literature invites us into a vision by which we can order our lives and resist that which is necessary to resist, opening our lives to the revelation of what or who really has dominion in the world and to the discovery of our own shared and individual identity and mission in the world.